"Let's race," you propose as we are on our walk. Your big sister eyes the trail in front of you both. There are twists and turns that are sure to trick your feet, and there are hills that will tire your muscles. But nothing can quite tire your spirit. And your big sister has a big heart, but she also really likes to win. "Whoever wins gets to decide the movie we watch tonight, okay?" Your big sister looks down at her legs, suddenly aware of her advantage. And just like that, you are both off -- on the same path but on totally different journeys. The rocks scattered before you both may look different, but you will each understand the character and fearlessness it takes to face your own obstacles. You may skin your knee. Your sister may scrape an elbow. But you will both learn about the enormous amount of strength and commitment it takes to stand back up and keep going. Your hills may be taller; hers may seem smaller. But you will both realize that no hill is a match for the drive and determination you each possess within yourselves. One of you may reach the finish line before the other -- heart racing, muscles aching, hands lifted in victory. But you will both know the beauty of accomplishment in your own time. And today, before you both could reach that finish line, you stop. "My legs hurt, sissy! I'm tired" You shout at your big sister who is now far ahead of you. I watch your body slowly turn to jello as your shoulders droop down in exhaustion. 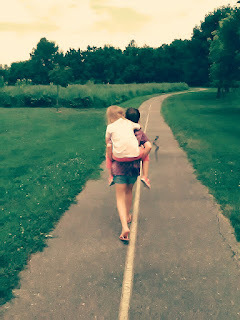 Your big sister stops her sprint, turns around, and hoists you on her back. Even though you are on different journeys, more than once your paths will intertwine. Today, you crossed the finish line together.